Major maritime events heralded the birth of both of our children. Helen was born in August 1979, at the time of the Fastnet Yacht Race Disaster. Storms wreaked havoc on over 306 yachts taking part in the biennial race, resulting in 15 fatalities. On a happier note John arrived in October 1982, just as "The Mary Rose", Henry VIII's Flag Ship, was raised from the sea bed. The hull and many artefacts are now preserved at Portsmouth. (Note: a new museum is being constructed for the hull, which will not open until mid 2012.) 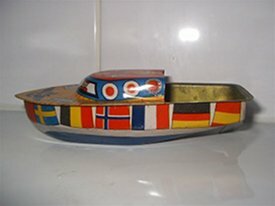 Anyway the tenuous steam link is pop pop boats with flags, dare I call them FLAG SHIPS! 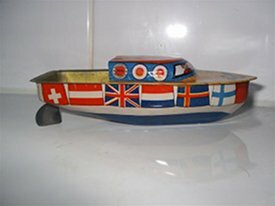 Moving on, there seems to be two main reasons for displaying flags on these wonderful toy boats. Firstly, like the one in the quiz, the manufacturer is targeting a specific market. In this particular case the "Common Market"! plus Switzerland. I have included several more pictures to illustrate this point. 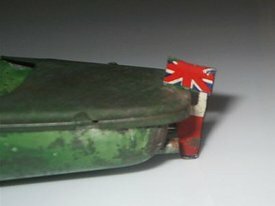 The pictures above show the 7.5" (19cm) long "Speedo" Lifebuoy boat flying a sort of Union Jack. 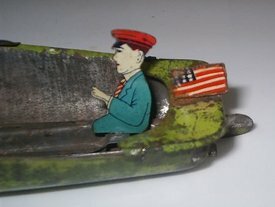 Figures 5 & 6 display the Stars & Stripes aboard the curiously named "Pom Pon" speed boat (6.5" – 17cm long). 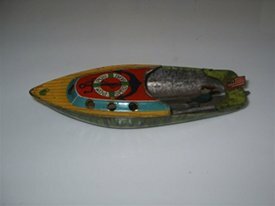 Both boats are made in Japan, yet they are clearly aimed at specific export markets and probably date from the early 1950's. The other reason for "flying the flag" is to declare the country of origin. 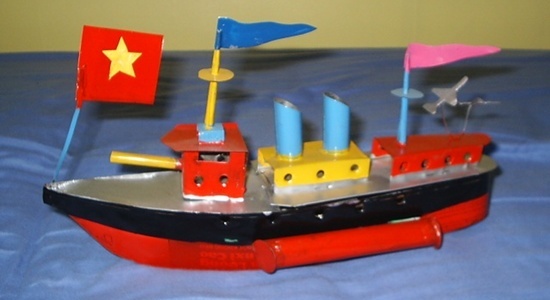 The picture below shows a fairly recent primitive warship, made from recycled tin, hailing from Vietnam. 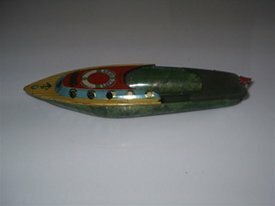 The pictures below show a 1950's offering from Italy (left), made by Bordoli, and lastly one of the amazing little gunboats made in Indonesia (right). These are particularly amusing, as the guns move up and down, precipitated by the vibration of the pop pop engine diaphragm. Fig 2. Left to right. Switzerland, Austria, UK, Holland, Aaland Islands (part of Finland) or maybe they meant it be Iceland and used yellow instead of white and lastly Finland itself. If you got 9 give yourself a pat on the back, if you got 10, I'll look forward to seeing you on Mastermind!